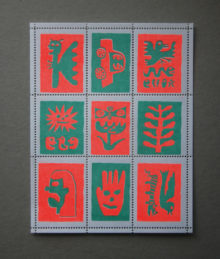 The Artist Series is an ongoing collaboration with invited designers, artists, and writers who create original work for an unusual form: the poster stamp. Upcoming artists include Rebeca Méndez, Kate Bingaman-Burt, and Bráulio Amado with many more to follow. The poster stamps are printed with letterpress, risograph, or digital output on lickable, gummed paper and pinhole perforated by hand on our vintage machines. The sheets are signed and numbered by the artist, and released in a limited edition of 100. Mike Savage's paintings are a meditative diary: handmade analogue recordings. 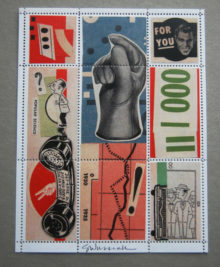 For his artistamp—a folded 11" x 4.25" sheet—he hand perforated each sheet individually and uniquely. 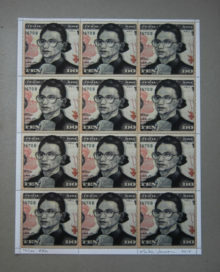 Portland based artist Malia Jensen creates her first stamp, a printed provocation, part of her "Changing Money" series featuring a portrait of Ruth Bader Ginsberg. 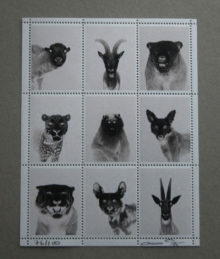 Christina Seely's artist stamp features photographs of endangered animal specimens from a set of kinetic mirrored light box portraits called Next of Kin. Contemporary artist Cynthia Lahti believes that even small artifacts can evoke powerful feelings. This signed, limited edition of 100 is her first stamp. 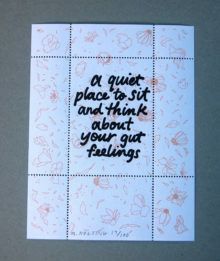 Walker Cahall is an illustrator, designer, maker, teacher, and worldly thinker based in Portland. 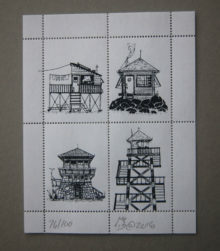 His stamps feature hand silkscreened drawings of ranger lookout towers. 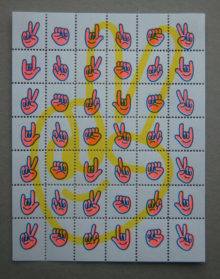 Artistamp No. 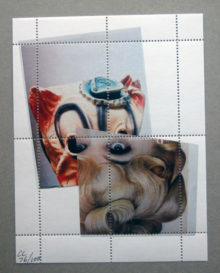 2 is by Brooklyn-based Canadian collage artist Allan Bealy. 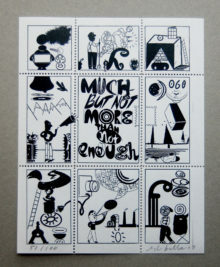 Each sheet in the edition of 100 is individually rubber-stamped and signed by Allan. 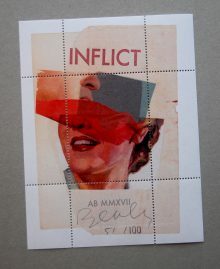 The first limited-edition stamp features the work of Los Angeles artist-designer Ed Fella who collaged and reassembled every little element from past work.